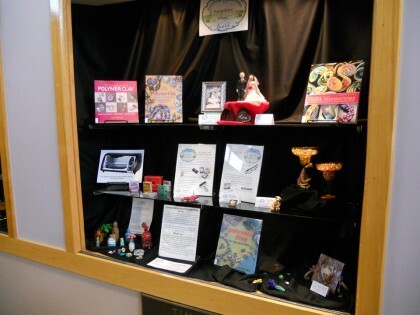 The Central Oklahoma Polymer Clay Guild set up a display in the Midwest City Public Library today. 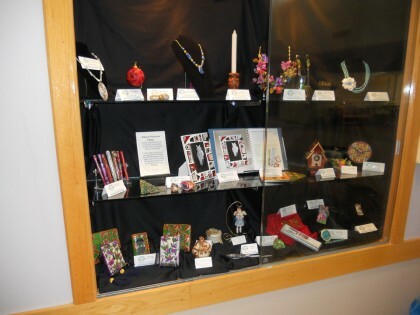 There are three large display cases, and we managed to fill them to capacity with an artistic arrangement of polymer clay items in a wide array of styles. It seems many of us like Southwest or Native American themes, because one entire case was filled with artwork inspired by those motifs. The display will be up throughout the month of April. The library’s address is 8143 East Reno Avenue, Oklahoma City, OK. Come by and take a look at our artists’ handiwork! Previous post: Get Your Motor Running!